Chef Marcus Samuelsson is known for his highly acclaimed Aquavit restaurant in New York City, which has been serving top-level contemporary Swedish cuisine for more than twenty years. We're happy to report that his first venture in Japan measures up to that same impressive standard. The cooking is superb - fresh, inspired and provocative. And Aquavit's modern Scandinavian outlook adds a welcome note of culinary diversity to the French- and Italian-dominated top ranks of Tokyo's international restaurant scene. The dining room is bright and energetic, hung with artwork and decorated in a fusion of contemporary Japanese and Scandinavian styles. The sleek design is warmed by homey touches like the antique peppermills on the tables and the grove of newly planted trees in the pocket garden in back. 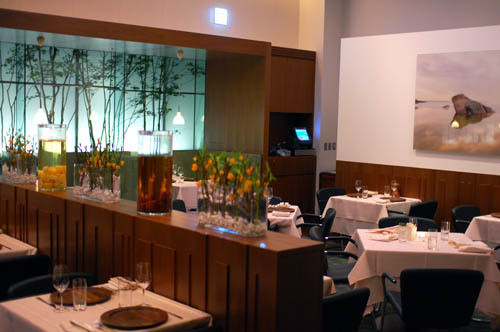 Aquavit's setting is also a cut above the typical-for-Tokyo office building or shopping mall; after your meal you emerge onto an attractive little plaza with a fountain, overlooked by a fashionable Aoyama flower shop. One of the unique charms of Aquavit New York has been recreated here - a large menu of home-made aquavits, in surprising flavors like horseradish and pear-vanilla-black pepper (two of our favorites). They make a refreshing aperitif, either at your table or in the stylish bar-lounge area. Thrill-seekers can try the offbeat aquavit-based cocktails like the Aquapolitan or the Spicy Mango Martini. The starter menu gets things going with enticing flavor combinations like venison carpaccio with cheese, celery root, radish and black truffle; and foie gras ganache with cured and dried duck and apple compote. In a nod to Swedish tradition, there's a four-herring assortment which includes vodka-lime and curry-apple variations along with boiled potatoes and cheese, and what the menu refers to as "necessary accessories" - an ice-cold shot of aquavit and a glass of beer. First-timers might go with the smorgasbord starter - ours was a big square plate topped by a grid of nine different appetizers in bite-size portions. Even before the starters, our palates were properly awakened by a deliciously creamy potato-leek-anchovy soup, just salty enough to activate the taste buds, and a tiny amuse of cheese flan and salmon with a dot of smoked egg yolk. Excellent potato bread and crispbread are served with herb-flavored butter. The main dishes tend toward multi-element assemblages with a balance of complementary flavors and textures. For example a succulent seared duck breast was paired with a marvelously crisp confit - the thigh meat lightly accented with tarragon and playfully shaped into a cube - and served alongside soft parley spaetzel. Then there was the roast lamb - tender, flavorful top-quality meat cooked to perfection - paired with a spice-infused ragout of lamb wrapped in crunchy kohlrabi. From the fish side of the menu we can recommend the richly flavored hot-smoked trout, served in apple-horseradish broth with celery-root puree and mushrooms. The fresh and inspired flavor combinations continue through dessert. Aquavit's Swedish pancakes are perhaps the most entertaining - you assemble them yourself with dollops of whipped cream, ginger confit and raspberries. Then there's the "Arctic Circle" (goat cheese parfait with cassis sorbet), and a rich, brownie-like chocolate-custard cake with salty caramel ice cream and diced cherries. Unfortunately they didn't have herb tea on the menu (but that was really our only complaint). They do, however, have after-dinner-style aquavits in flavors like pineapple-basil.